The global froth flotation chemical market was estimated to be valued at USD 1,775.38 million in 2017, and is expected to register a CAGR of 3.74% during the forecast period of 2018-2023. By reagent type, the collector segment held the largest share in the froth floatation chemical market, in 2017. The anionic collector sub-segment accounted for the largest share among the collector types, in the global froth floatation chemical market. It is also expected to be the fastest growing segment during the forecast period. The mining industry is the largest end user of froth flotation chemicals. The chemicals are used in mining activities, according to the nature of the mine explored in the area. Froth flotation chemicals help in the extraction of minerals, by allowing them to attach to air bubbles. Collectors are the major froth flotation chemicals that boost the wettability characteristics of the required minerals, for the adsorption of molecules on the mineral surface, reduction of the mixture’s stability, and separation of minerals. Additionally, the segment is expected to register the highest growth over the forecast period, at a CAGR of 3.89%. After a downfall in 2012, the mining industry has recovered significantly, to return to profits. Countries, such as Australia, China, and Myanmar (Asia-Pacific), Canada and Mexico (North America) and Brazil, Peru, and Chile (South America) dominate the mining industry. In 2017, Asia-Pacific accounted for the highest share of nearly 46% of the global market. The Asia-Pacific market is mainly driven by the large-scale mining operations and the increasing demand from the pulp & paper industry. 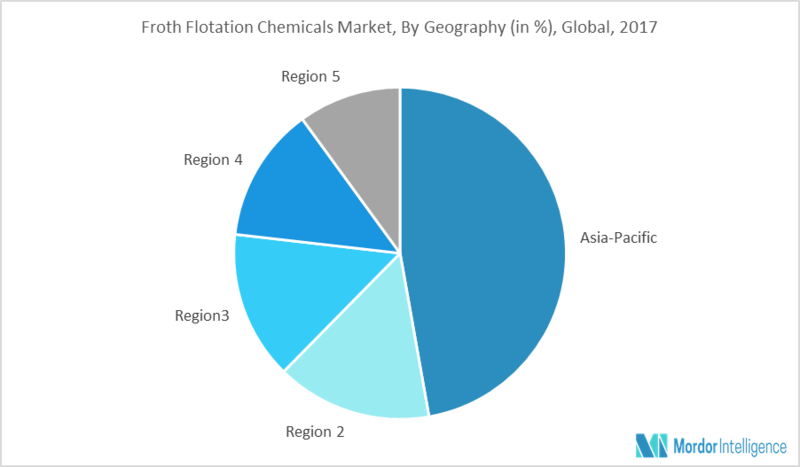 In addition, Asia-Pacific is the fastest growing region for froth flotation chemicals and portrays a huge potential for growth in the future, owing to the increasing investments in the market. China is the largest consumer of froth flotation chemicals in the world. The country holds approximately 28% share in the global froth flotation chemicals consumption. The country is one of the largest producers and consumers of mining products. Froth floatation chemicals are largely used in the mining industry for recovering minerals from the slurry, separation of impurities, purification of certain minerals, and various other applications. The chemicals are employed in wastewater treatment, paper & pulp production, and other major uses. April 2017: AkzoNobel outlined a new strategy to accelerate growth and create value, with two focused, high-performing businesses, such as, Specialty Chemicals, which will lead change in the value creation for shareholders and stakeholders. Major Players: BASF, Cytech Solvay, Clariant, and DowDuPont, amongst others. The regions and countries that are expected to witness the fastest growth during the forecast period.